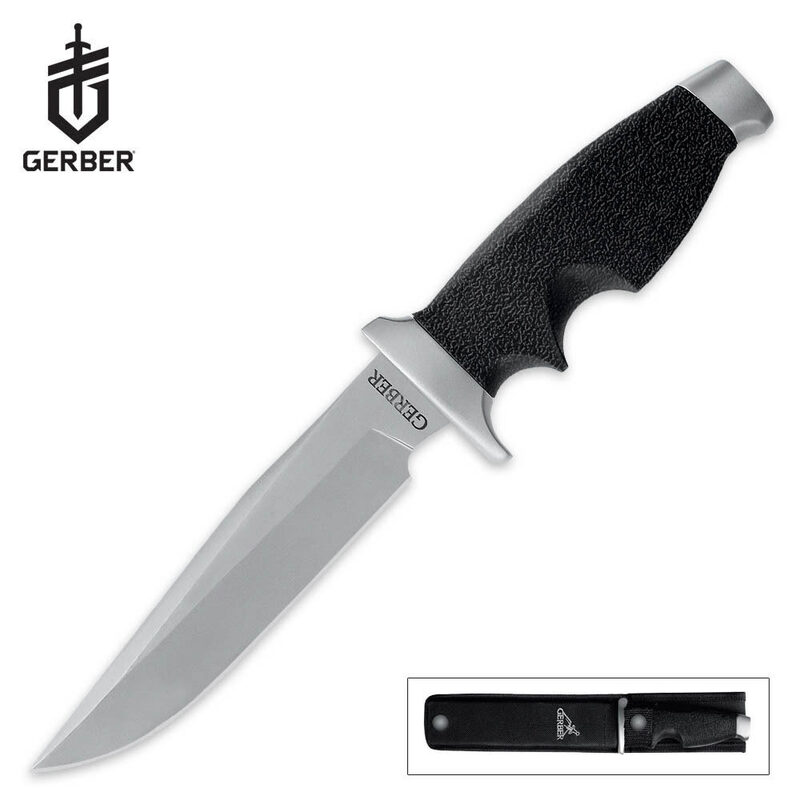 With the Steadfast, Gerber re-introduces a classic knife from their past. Features a 6 in. 440A stainless steel full tang clip point blade. The textured handle features finger grooves and a stainless steel guard for a safe and secure grip. Includes a ballistic nylon sheath with protective inserts. 10 1/2 in. overall. I received this knife yesterday, and i'm pretty pleased with it. I deal with knives of all types and qualities, and have been for awhile, and as always, Gerber hasn't disappointed me. First, the knife itself. It feels very solid and sturdy in your hand, and indeed it is a solid knife. The treated rubber handle is very non-slip, and the finger molds make the knife feel fitting in your hand. It is a larger-than-average handle, and i prefer smaller handles, but it would be fitting for most. However, the molded handle makes it difficult to hold the knife in a reverse position. The blade is solid and single edged and came extremely sharp. Now the sheath. The sheath is very basic; simple nylon with a hard plastic insert. It features a belt loop and another smaller loop on the bottom for another tie down option. It has a single clip that does its job of holding the blade securely. Overall, i give this knife an 8 out of 10.